You are not logged in. [Log In] ETS Forums » Forums » The Survival Forum » The Survival Forum » Binoculars in your Kit? I keep an inexpensive pair of mini binos in the BOB and a full size set in the car. Next time I see a good deal on mini binos, I'll get a pair for the car BOB. Was looking at them last night. can binoculars be used to start a fire as well? dual use would greatly increase the chance of me luggin em around. Oh, the really old ones. Uncoated lenses, unarmoured, not waterproofed, not nitrogen filled. They don't make them like that any more. Many years ago I took a lens from an OLD pair of "field glasses" ... I doubt that you could put the binoculars back together again and have them work as well as before. It's not absolutely necessary to disassemble a bino/monocular for making fire if nothing else is available for that. Just play with the focuser a bit to make the sun image appearing as a sharp circle on a piece of paper, and then move in some dark colored tinder as close as possible to the eyepiece. 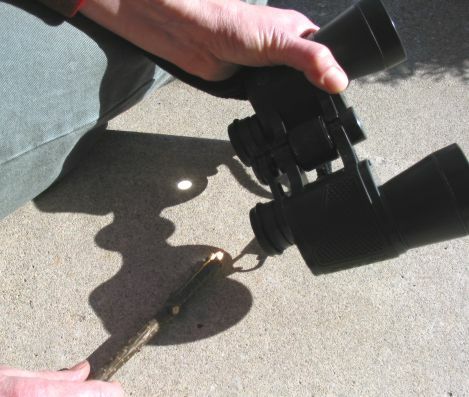 Be careful enough not to damage the eyepiece as the tinder light's. Also this way it seems to work better, in case your bino/mono objective lens is smaller than 1 inch. I'm carrying the SpecWell (Japan) 8x20 monocular with extra short focus most of the time. Reasonably portable, wide field of view, and fantastic clarity. It works very well as a microscope at 12 inch distance too. Used it a couple of times to melt the ends of paracord. I carry a close-focussing monocular. One advantage of monoculars is that you can get ones which focus on things less than a foot away, so they act as magnifying glasses or (very weak) microscopes. You can get a good look at, eg, insects which you might not want to touch. For distance vision they are useful for checking out routes and signposts so you don't waste time going the wrong way. You can also check out other people before you get to them, if you think they may be hostile. If you watch 24 you'll know that Jack Bauer is always peering through his monocular. Generated in 0.033 seconds in which 0.011 seconds were spent on a total of 14 queries. Zlib compression enabled.